Asking our Customers to engage in our recent 70 question survey was a difficult and anxious proposition. We didn’t know how it would go over. After all, NetBurner wants to save you time, money, and help you get your products to market faster and easier, not bog you down or make you hate us. Filling out a long survey was really asking our customer base to take one for the team. Knowing that, we were extremely surprised and excited that the participation exceeded our expectations and we are grateful to all those who took the time to help us out. We’re really proud of the fact that NetBurner has been in the IoT business for over 20 years, producing its first network-enabling solution in 1998, well before IoT was IoT. As we have grown, we realized more and more that our community keeps us going and excited to produce then next generation of awesome embedded products. We know we’re not perfect and that we have many areas where we can improve. Our recent survey is part of an ongoing effort to constantly refresh our perspectives and to do even better for all you NetBurners out there. It is our goal to provide a smooth, cohesive, and enjoyable User Experience (UX) to our community of customers, partners, developers and readers. Ideally, this UX extends from your first visit to our website to sales through many years of use with our content, products, support, and other services. 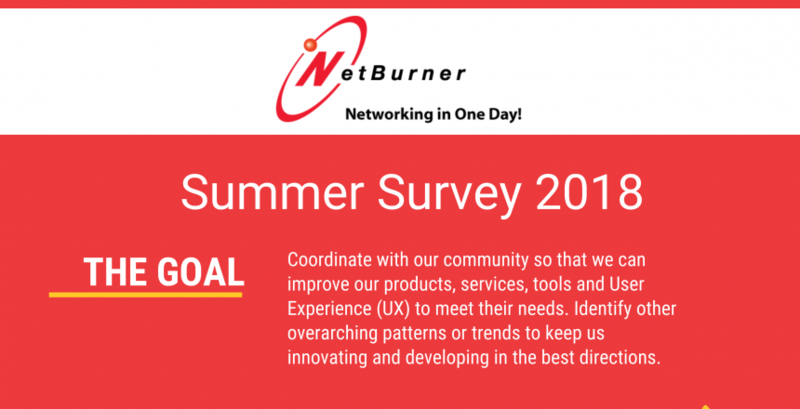 Using this survey, we wanted to gain a better understanding your needs, work requirements, frustrations, preferences, and industries as well as understand the level of value that NetBurner provides to you. We were also hoping to better identify and prioritize what we should improve. When we embarked on this UX survey effort, we could have gotten holed up in the boardroom and made our best assumptions about our users… but you know the old saying about that! Instead, in our search for genuine and well informed information we decided to directly approach those of you in our community. We wish we could have done this in a more personal way, but unfortunately we don’t have that kind of time or budget! The information obtained will be used for everything from our upcoming website and store redesign, content creation, product roadmapping, service enhancements, and lifecycle management. All of this effort really helps us to serve you even better by ensuring that everything we do at NetBurner is more focused and intentional. We also hope to test, revisit and update these findings through the course of time. We thought it would be interesting to share some of the insights and questions that we were able answer through this experience. Like, who are NetBurner users? In what type of work, applications and industries does NetBurner get utilized? How satisfied are you with our products, services, and other attributes? What related or new technologies are hottest and in demand? As you know from the barrage of questions, this was just the tip of the iceberg. We thought it would be neat to share a few of the good and bad quotes from the survey. We kept them mostly anonymous but we promise they are genuine! In a few cases we decided to provide our feedback. “NetBurner’s boards and development tools have been very easy to use since day one. Solid quality, good documentation and examples, and fun to program.” — Evan B. Our Response: Keeping your lives simple is a big goal for us… at least the part that is involved with embedded development. We are really glad to hear that you feel this way, and you are very welcome! Our Response: While we strive to make great products that stay on the cutting edge of technology, we understand that each design will have requirements that might not fit with any of our current offerings. If you have any specific requests for future products (specific memory requirements, development capabilities, etc), please feel free to let us know. We love this kind of feedback and can often work with customers to help them find a solution that fits their needs. Our Response: We are really sorry to hear this. If you were using our beta USB module for development, we would love to hear more about your experience, especially if you found the examples for the SD card or the USB difficult to use. Our Response: We are pretty sure this is one of our engineers taking the survey incognito… or maybe great minds just think alike. This is an idea that has been kicked around from time to time, and we are currently trying to figure out where it fits in our priorities. Knowing that there is someone out there as excited as Mike is about it is great to hear. Our Response: This is exactly what we want to hear. Thank you! Our Response: We don’t have any plans of stopping! In fact, we are juuuuuuust about done with an entire upgrade to our tools and software that should make many aspects of development even better. Our Response: Thank you very much for letting us know. This is also exactly the kind of feedback we like to hear! Our Response: Indeed it is, and we have no plans of stopping them! The MOD5272, for example, has been around for 17 years and we are still manufacturing and selling them today. Our Response: This does sound like a nightmare! Please feel free to contact us at support@netburner.com or sales@netburner.com and one of our engineers would be happy to troubleshoot any issues you are experiencing. Our Response: We think of you as a friend too! Hearing things like this is what keeps us going. That and strong strong coffee. Thanks again to all those who either completed or tried to complete the recent survey. We appreciate the open and candid responses. As you can tell, we gained a great deal of insight and were more than happy to award over $500 in prizes to those who participated. For those who didn’t have time or didn’t notice the invitation (or want another shot at a prize! ), we’ll be sending more of these out in the future. In the meantime, do not hesitate to comment below, email us, ping us on Facebook, Twitter, or LinkedIn with any thoughts or suggestions you might want to share. We’ve definitely learned a lot from this experiment and truly believe our value to you will only increase from the feedback.